Jack Coleman Cook is finally receiving the honor he deserves for his bravery and heroism that day. He has now received and is still receiving several honors and today I want to share with you Jack’s honor that was entered into the Congressional Record of March 21, 2018 by Arkansas Congressman Bruce Westerman. Mr. WESTERMAN. Mr. Speaker, I rise today to recognize Sergeant Jack Coleman Cook of Hot Springs, Arkansas, for his heroic actions in World War II when he selflessly sacrificed his own life to save his fellow airmen. Sergeant Cook was a ball turret gunner on a B-17 Flying Fortress, the “Challenger,” with the 384th Bomb Group. On February 3, 1945, the 384th Bomb Group participated in a mission to bomb the Tempelhof Railroad Marshalling Yards in Berlin. During the mission, the Challenger was hit by flak, damaging multiple engines, gas tanks, and the fuselage, but left the crew unharmed. As they made their way back to base in England, their plane began losing altitude and crash landed in the frigid North Sea. As soon as the plane hit the water, the crew members proceeded to abandon the aircraft and pull out the two life rafts, but only one fully inflated. The pilot and radio operator swam for the partially inflated raft, but the pilot succumbed to the cold and passed away, and the radio operator was dragged into the sea where he was lost. The rest of the crew swam for the closer, fully inflated raft. Sergeant Cook, the first to make it, helped four other crewmembers into the overcrowded raft, while two men stayed in the water. Edward Field, the navigator who stayed in the water, began to push their raft towards the second raft. After thirty minutes in the water, Edward Field became numb, and said that he could no longer hold on. Jack Coleman Cook got into the water so Edward Field could take his spot in the raft, where he continuously swam for forty-five minutes until they reached the second raft. Shortly after, Air-Sea rescue reached their position, but Sergeant Cook had little life left in him, and he passed away on the boat. Sergeant Cook selflessly sacrificed his own life so Edward Field and his fellow crewmembers could live. Those men returned to duty only four weeks after the crash, where they bravely fought through the rest of the war. Jack Coleman Cook is a true American hero who showed bravery and courage in a time of great circumstance. He gave his life for his fellow man, and for this, we remember him over seventy years later. It is with great pride that I honor Jack Coleman Cook. Thank you Congressman Westerman and staff for recognizing Jack Coleman Cook with this honor. 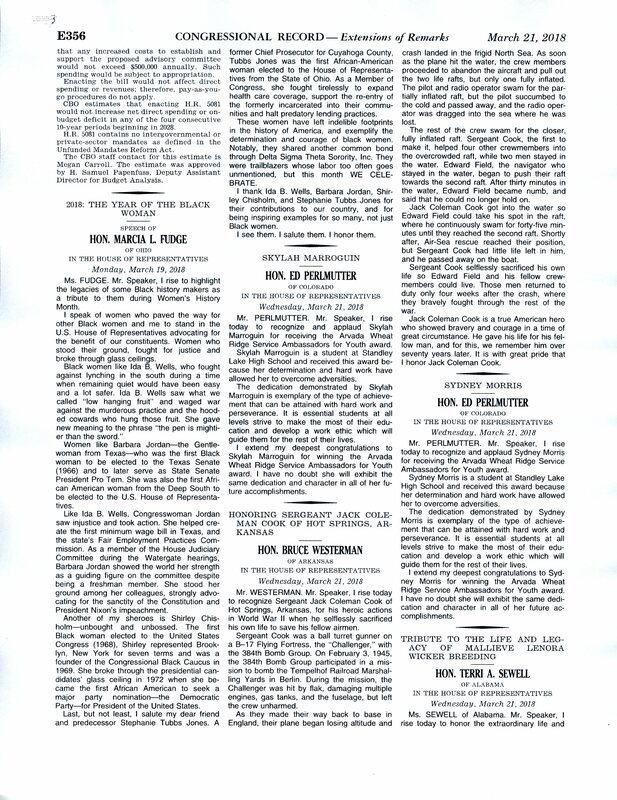 The honor in the Congressional Record can also be viewed directly here. By thearrowheadclub in 384th Bomb Group on March 28, 2018 .